La Truco & Talegón de Córdoba "Pa mis adentros " dance, guitar and cante (vocals). 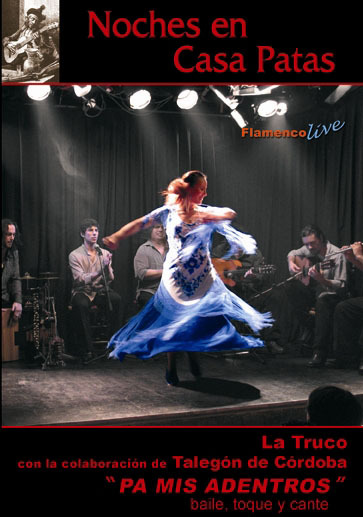 ''Pa mis adentros'' This is the title of a show recorded live in one of the most traditional flamenco tablaos in the whole of Spain: Casa Patas. Access to two different set ups for the dancing: one with all musicians, the other focussed on the dancer, showing it from different angles. It also includes interviews with all protagonists and the ''making off'' as well. The DVD is full compatible with all countries (PAL and NTSC). Video PAL system for Europeam countries. Video NTSC system for Americam and Asinan countries.